Coral Nano Silver Toothpaste packs the power of Coral Calcium, Xylitol and “Nature’s Antibiotic”, Nano Silver. and is designed to strengthen and restore enamel while safely killing over 650 types of bacteria and pathogens. Providing you with a healthy, fresh, all over clean feeling in your mouth. When you use Coral Nano Silver Toothpaste, you'll be naturally whitening your teeth and you will be fighting against bad breath, gum disease, and plaque build up! 7 REASONS CORAL NANO SILVER TOOTHPASTE IS TAKING THE COUNTRY BY STORM! Naturally Whitens Teeth= An acidic mouth promotes the growth of bad bacteria, which can lead to the softening of your teeth, allowing them to become worn down and stained. Xylitol reduces mouth acidity, eliminates harmful bacteria and helps build minerals into teeth, making them stronger and brighter. Proven to Kill 99.99% of Germs that Cause Bad Breath-Known as "Nature's Antibiotic" the active nanosilver in Coral Nano Silver Toothpaste is known to kill over 650 pathogens and is clinically proven to kill 99.99% of the bacteria that cause bad breath, plaque and gum disease. Fluoride-Free, 100% Safe to Swallow- FACT: 50 studies have linked fluoride with reduced IQ in children and many children now exceed recommended daily fluoride intake from toothpaste alone. Coral Nano Silver Toothpaste is always all-natural and fluoride-free! Works While You Sleep-The all-natural active ingredients in Coral Nano Silver Toothpaste continue to work overtime up to six hours after brushing. So you wake up with that just brushed squeaky clean feeling. Eco-Friendly- You can feel good about using our product knowing our coral is mined from our own ECO-Safe above the sea coral mines. Taste's great- Loved by kids and picky parents alike. Coral Nano Silver Toothpaste comes in two refreshing flavors, Mint and Berry Bubblegum. A lot of customers reach out to ask us how the Nano Silver technology works. It's both incredibly complicated and extremely simple. Let's start with the simple. Nano Silver technology is a uniquely designed formula which boosts the silver allowing it to attack bacteria and pathogens at a 10 times more effective rate. This specific process has been through rigorous testing including over 400 major independent reports and human clinical trials. This is not only the future of dental health. Nano silver technology is the future of general health. There are so many possibilities for using this technology. It's imperative we as humans work to keep our immune system healthy and strong. The better our immune system the faster our ability to heal. Humans all over the world have been using silver for centuries to prevent illness and to speed up recovery from injury. ✓ Greeks used bowls made with silver to keep water and other liquids clean. ✓ Romans stored their wine in silver urns to keep it fresh. ✓ Before antibiotics, it was common knowledge disease-causing germs could not survive being around silver. So silver was often used in dish-ware, drinking containers and eating utensils. ✓ During the Middle Ages, people believed silverware was what protected the wealthy from the plague. ✓ Australian settlers used silverware in their water tanks to stop spoilage. ✓ Early American settlers placed silver coins in their water jugs to keep bacteria and algae at bay. ✓ In the early 1800s, doctors used silver sutures in surgical wounds. ✓ During World War 1, silver leaf was used to combat infection in battle wounds. How Does Nano Silver Technology Work? Silver particles come in many different types such as basic ionic silver or ionic silver bound to a protein. Coral Nano Silver technology uses special Ag404 molecules which have been studied and shown 10 times more effective than traditional silver to destroy bacteria. It's so much more effective because each silver core has thousands of Ag404 silver molecule providing a silver oxidate coating to the core. These tiny molecules steal thousands of electrons from bacteria (what bacteria needs to function). This breaks down the bacteria much faster than traditional silver which only has one molecule stealing electrons. Killing bacteria is like fighting an opponent in a video game, each hit drains their life just a little bit. Each time a molecule removes an electron the bacteria's life source is weakened. Nano Silver is the silver's special power to a faster KO. Coral Nano Silver Toothpaste and Mouthwash not only cleans your teeth but also continues protecting them long after you brush. Nano Silver technology has been studied many times over the years and shown to provide incredible results for everything from bandaging wounds to weakening Malaria. It has shown a lot of promise for improving dental health. - Over 400 independent studies and test reports performed by more than 60 leading laboratories and universities. - 30 safety reports and studies. - 3 published and FDA cleared human ingestion studies. - 20+ peer-reviewed and published scientific and medical journal articles. One dental specific study completed by American Biotech Labs used a variety of patients with dental plaque, gingivitis, inflammation and bleeding. These patients used the nano silver technology twice a day for one week. These studies prove nano silver is non-toxic to any system in the body, even when people drank it on a daily basis. Coral Nano Silver will not build up in the body and has been shown to exit the body within 24 hours of consumption. 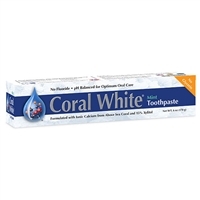 Please Brush Your Teeth With "Coral Nano Silver" At least 2 Times A Day.